When i was pregnant with my first child i looked everywhere for a nappy bag that was 'me'. I love bags and was excited that i had an excuse to buy a new one. At the time (2012) the market was dominated with expensive, plastic, stripped strapped, owl printed bulky bags that were so far from what i like and my style that i didn't end up getting one at all, instead i just used one i picked up at Primark - which obviously fell apart. However recently this has changed and there have been a few super cool brands emerging that have spotted this gap in the market and filled it with practical, stylish, good quality, useful bags that have been well thought out and designed and that will last way beyond the nappy years. Jem + Bea is one of these brands, their premier collection is impressive - super chic, classic, great quality bags that are built to last. From the outside they look like a stylish handbag but on the inside they are filled with practical pockets, contain a (matching) changing mat, an insulated bottle pocket, adjustable straps and there is even a slot for your iPad! Mine is called a Beatrice and i take it to work and when i'm out and about with the children. WHY WAS IT CREATED: We had this feeling that if there was a bag on the market with the same designer look and quality materials as the high end handbags we loved, but that had all the bits and bobs you need in a changing bag, that it would be a hit with other mums who felt there was a lack of options and loved bags as much as we do. WHAT WE NEED TO KNOW ABOUT YOUR BRAND: JEM + BEA create bags for style conscious mums who love bags and want to keep their style identity as well as being a mum. 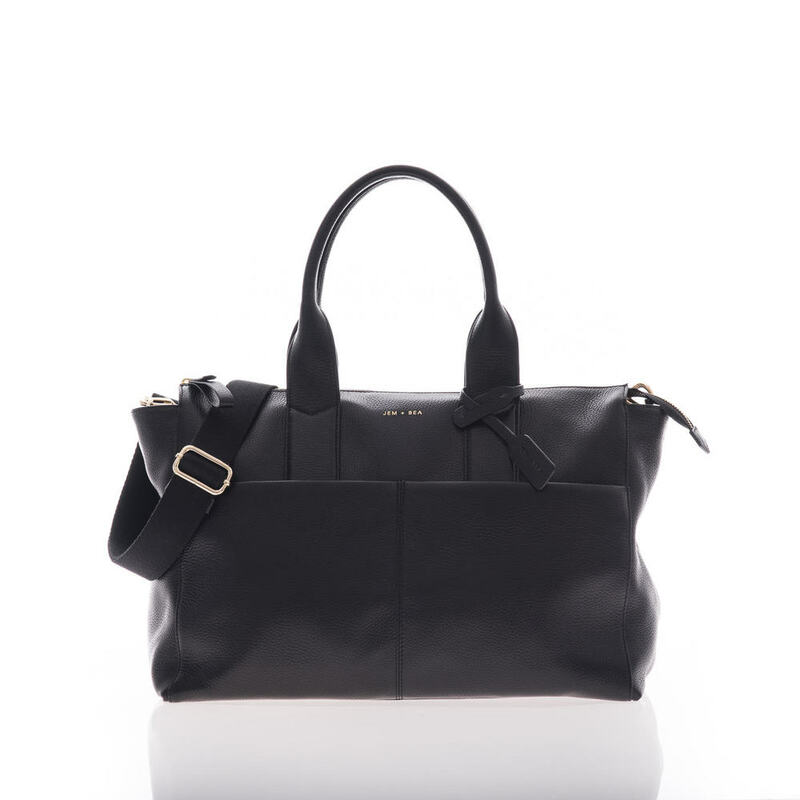 Our bags are centred around simple, modern shapes with a luxury edge. The high quality leather and materials we use mean the bags are built to last - baby years and beyond! Together with this, we've really thought through the interior of the bags so that everything works and is just where you need it. There are lots of well-thought out pockets for all your baby paraphernalia, but also handy things like key/dummy holders, as well as mobile phone and tablet pockets so they're designed with today's parents in mind. WHAT WE SHOULD BUY FROM YOU: The Jemima in black sold out within a week of the launch. The Jemima is a cool zip top shoulder bag with a pocket for everything yet the style of a high end handbag - she's been featured in Vogue as 1 of 8 most stylish changing bags and called an 'it' bag by Gurgle, we're over the moon! Also, unique to the Jemima and in fact any changing bag currently on the market, is a great leather mini clutch for all your mummy essentials - so you basically get 2 bags for 1! 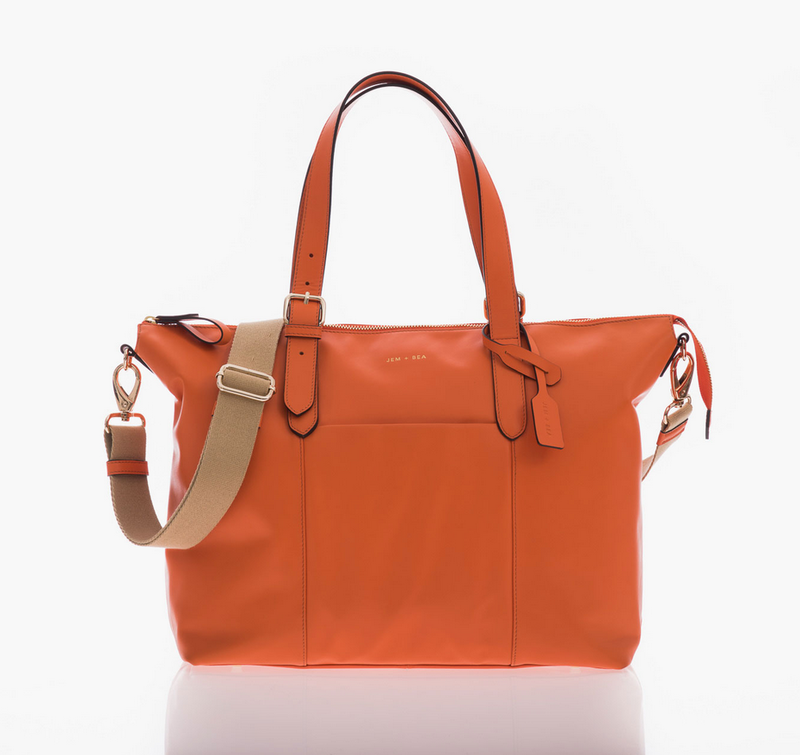 For a more streamlined bag the Beatrice is an easy yet chic ’throw it in and go’ tote - we love the orange, it gives a real punchy pop of colour and it's proving very popular. The Marlow is our casual cool offering for AW15 in quilted ripstop nylon - with it’s sports lux and unisex feel, it’s been a hit with both mum’s and dad’s. Our debut collection is a purposely small, neatly edited range to ensure we could make each bag tick all the boxes and form the staple for seasons going forward - becoming JEM + BEA future classics. We are now in full throws of SS16! - we plan to expand the range by rolling out 2 or 3 brand new designs and update our core range with an injection of colour and original prints - we can't wait to unveil it!